A company producing sustainable forest products with environmentally friendly methods. Panama Teak Forestry is an efficiently managed company in one of the safest, best-performing of all commodities tropical timber plantations and timber concessions with over 7,000 acres of timber resources and a mill that can produce tropical hardwood flooring, decking, wood paneling and other finished wood products. Timber has outperformed all major stock indexes over the past 30 years. It offers a solid return on investment and a hedge against inflation and currency devaluation. Panama Teak Forestry operates several plantations and timber concessions therefor the investors enjoy the high returns of timber investment without the risks inherent in direct land ownership. As its approximately 7,000 acres of tropical are harvested Panama Teak Forestry will begin to pay substantial returns. A recently completed mill and kiln will provide additional returns from the sale of processed lumber. The directors are investors. They receive shares in lieu of salaries, aligning their goals of sustained profitability and growth with those of other shareholders. Panama Teak Forestry is a certified green investment. Its holistic agro-forestry method of land management helps counter the greenhouse effect, enhances Panamaás reforestation program, and provides new jobs in rural communities. 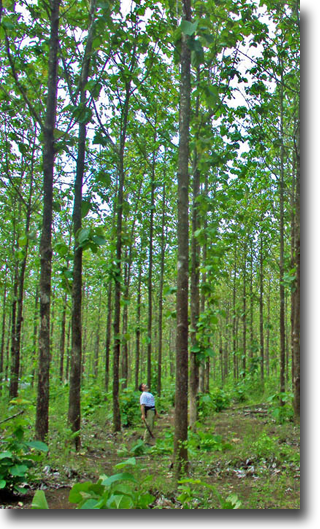 A tax- and IRA-friendly investment, Panama Teak Forestry is accessible to individual investors. The minimum purchase is 10 shares, currently priced at $2,636.00 per share. Of all the tropical hardwood species, perhaps among all tree species, teak holds a particular fascination for both consumers and investors, much as gold does among the precious metals. Valued for more than 2,000 years as an extraordinarily durable construction timber in its native range in Asia, teak is now coveted worldwide. Its extremely high dimensional stability and unique aesthetic qualities keep it in high demand for shipbuilding and fine furniture manufacturing. Teak is also well suited for finishings such as door and window frames and any other applications that require a strong, stable, durable hardwood. As the sustainable supply of teak from natural forests in Asia diminishes, demand for teak increases, and teak prices rise, we expect to see expanded production of plantation-grown teak. Teak cultivation has been the subject of research programs in India, Indonesia, Thailand and Myanmar since 1960, and best-practice techniques for producing high-quality plantation teak are well documented. Because teak is relatively easy to cultivate, has excellent growth rates, and provides a lucrative return, it is very suitable as a plantation timber species in areas with appropriate ecological conditions. Investment in properly managed teak projects is a "win-win" situation in a country such as Panama, where government programs are in place to encourage reforestation through generous tax credits. The investor makes a profit, new jobs are created, land is reclaimed, and there are long-lasting environmental benefits from tropical wood binding of carbon dioxide. Promoting a long-term responsible forest management strategy that protects and improves the health of forest ecosystems as well as contributing to the economic well being of the communities surrounding our managed forests is an integral part of Panama Teak Forestry commitment to the international growth and social health of the timber industry. Panama Teak forestry adheres to and supports the Forest Stewardship Council ® (FSC) Standards and Policies and strives to work with its affiliated companies and other interested groups to meet or exceed the FSC international Forest Management Standard. Panama Teak Forest is a vertically integrated provider of sustainably harvested and managed tropical hardwood forests that provides economic, conservation, and community benefits to the communities that gain from the work and timber operations it is involved in.